In a powerful speech at a Labour Jewish Movement conference Mr Brown hit out at the “conspiracy theorist Left” who support Mr Corbyn and have taken over the party. He called for Labour to “unanimously, unequivocally and immediately” adopt the internationally agreed definition of anti-Semitism. 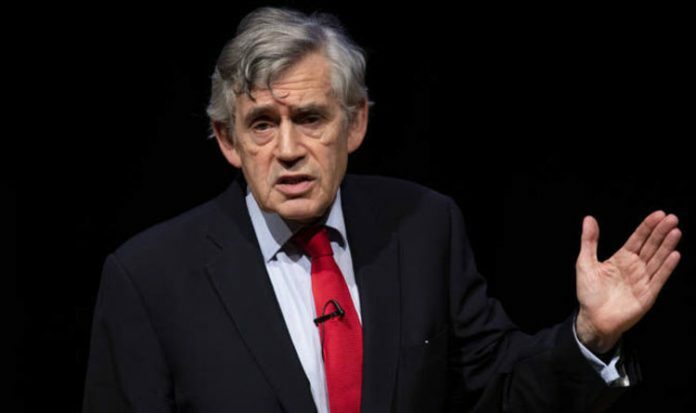 The former prime minister made the plea ahead of a meeting this week of Labour’s ruling National Executive Committee on whether to adopt the International Holocaust Remembrance Alliance declaration. Mr Brown said it was not simply about a change in policy but was “about the soul of the Labour Party”. He told the Jewish Labour Movement conference in Finchley, north-west London: “I believe that the Labour Party will change the policy. I believe that the Labour Party must and should change the policy. Mr Brown’s speech received a standing ovation as he outlined growing antiSemitism among not only the “jackbooted” Right, but also the “conspiracy theorist” Left. “This is a problem that is real and present and something that’s got to be dealt with now,” he said. The intervention came amid reports a group of Labour MPs were planning a vote of no confidence in Mr Corbyn over antiSemitism. Last week Frank Field MP resigned from the Parliamentary Labour Party over far Left “thugs” and anti-Semitism. Speaking on the BBC’s Andrew Marr Show yesterday, Lord Sacks said: “Jews have been in Britain since 1656, I know of no other occasion when Jews – the majority of the community – are asking ‘is this country safe to bring up our children?